Spray Booths – System Technologies, Inc.
Spray booths, which are enclosures used in the application of a uniform paint coat, are utilized to limit the exhaust of toxic fumes to designated areas. 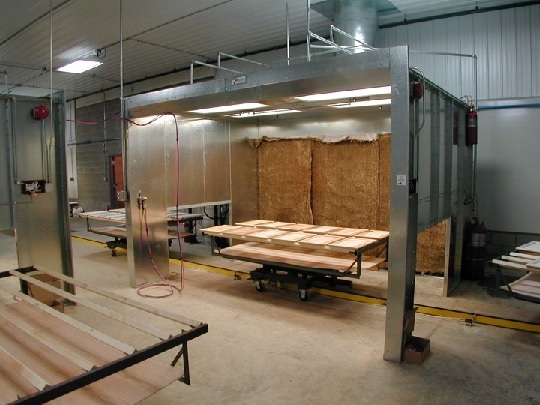 Spray booths are common in manufacturing plants and in professional workshops. Paint equipment can drastically vary in size and capability based on the application. These equipment types include paint booths, paint sprayers, paint systems, striping machines, airless paint sprayers, automated paint finishing equipment, electrocstatic painting, hardcoat systems, powder coating equipment and more. Spray booths come in a variety of designs, from small cabinets to entire rooms that can accommodate the machine operator in addition to the items to be coated. Spray booths are used for the application of paint, powder, and thermal coating and can have special features that allow for the recollection and reuse of paint. Since moving air is constantly being exhausted from spray booths, a like amount of replacement air must be supplied at all times in order to ensure continued effectiveness of the sprayers. Filters are provided with spray booths for both intake and exhaust areas. These high performance solutions are ideal for a number of different of applications and often times many industries will use a variety of different paint finishes, stains, and protective coatings to protect their products. Spray Booths Spray booths are power-ventilated enclosures that accommodate paint spraying operations. Spray booths inhibit dangerous paint fumes from being exhausted into the air while also preventing neighboring objects from the accidental accumulation of paint particles. Industrial jobs often require special painting equipment like spray booths.